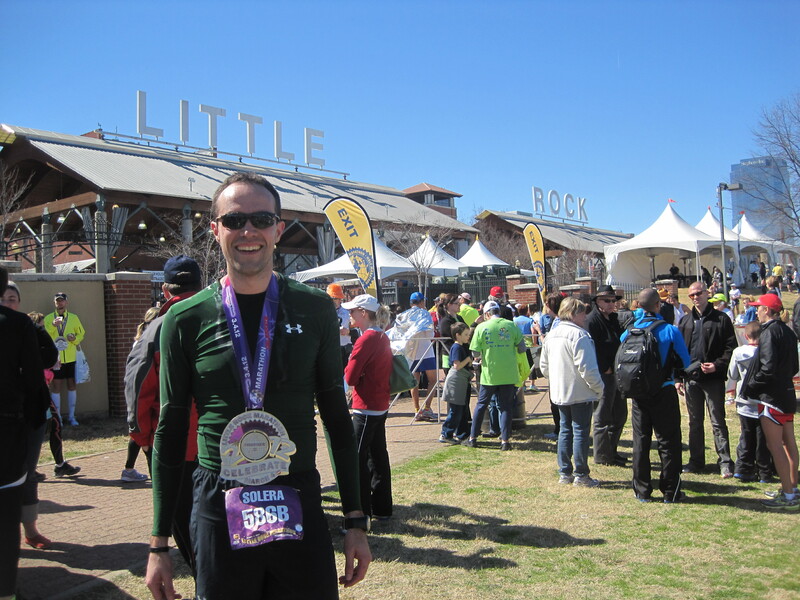 I won’t tiptoe around this point: the Little Rock Marathon is famous for its mammoth medals. Now that I’ve gotten that out of the way, it’s no surprise why I chose it for my Arkansas race. 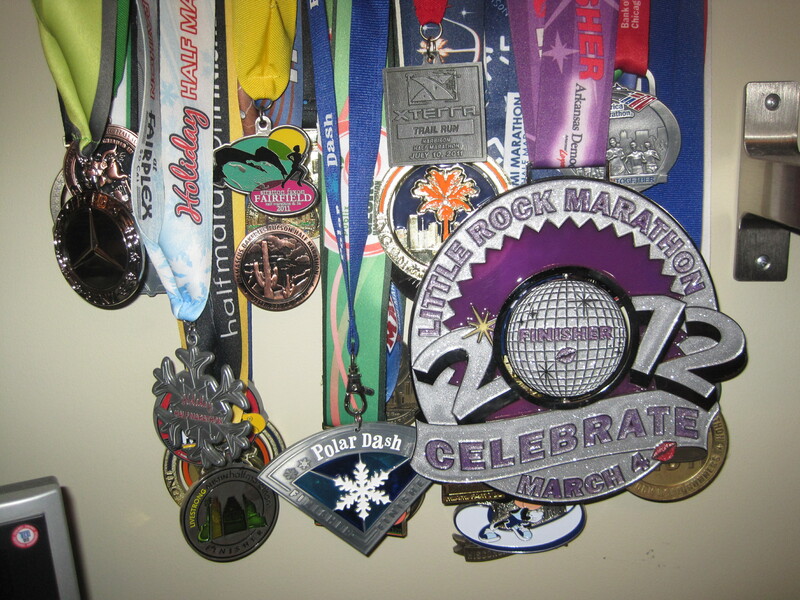 I’ve mentioned it more than once in these recaps and it’s worth mentioning again: I love race medals. I didn’t get into the sport for them, because I was surprised to see young volunteers handing out little metal tokens with ribbons tied to them at my first half marathon. I honestly thought it was a little silly at first: what’s the value or significance of a trophy if everyone gets one? But as the races piled on, I developed a fondness for the memento. It’s nice to put in the time, energy and sweat in training for a long-distance race and have something that will remind you of it in later years. It’s become standard practice for any race of 13.1 miles or more to give medals to its finishers, but not everyone does it. Every now and then you’ll find races that give away other prizes besides medals: steins, coasters, or belt buckles for example. Others don’t use metal and prefer wood, clay, even glass. Most organizers try and infuse the race or host city’s character in the design, hoping that it will single-handedly capture the spirit of the event. 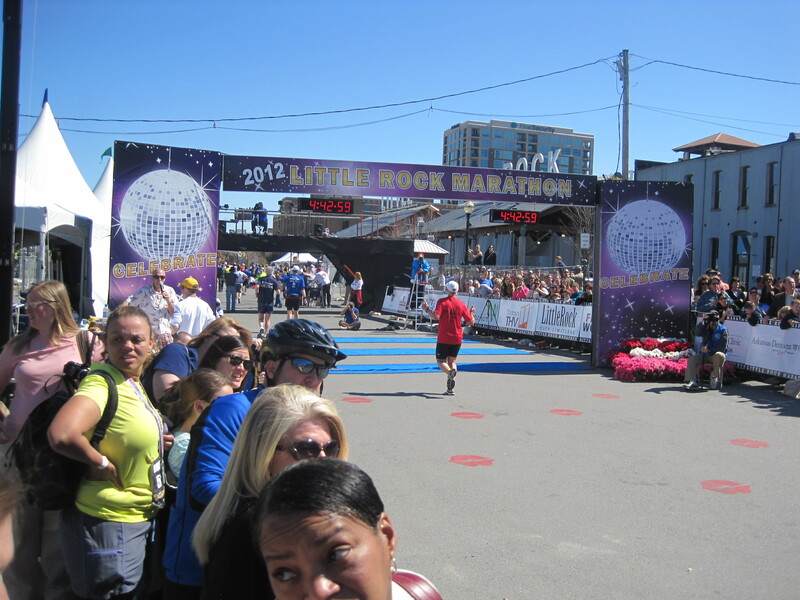 But the signature feature of the Little Rock Marathon’s medal is its gargantuan size. I’m not entirely sure when they started the tradition, but at some point in its history, race organizers decided that runners should be rewarded for their efforts with something truly monumental. 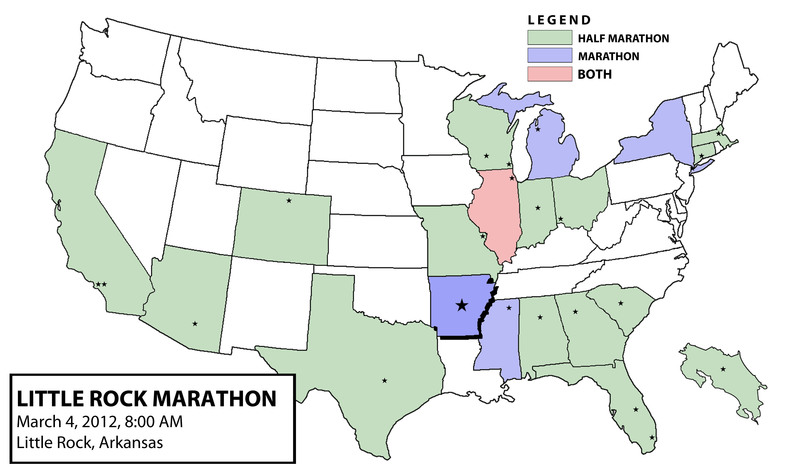 It wasn’t long before I discovered this and added the 2012 Little Rock Marathon to my race calendar. Along the way, Otter became a medal junkie and signed up as well. I took the training for this race seriously and put in enough mileage with the respect necessary to tackle a marathon. I’ve been getting much faster at the half marathon but haven’t quite seen a similar breakthrough in the full distance. So I hit my numbers, cross-trained diligently and even put together a four-week taper to ensure that I’d have well-rested legs for the event. So why was I a nervous wreck at the starting line? If everything had gone according to plan and I was confident in my training, why did everything seem like it was going to go horribly wrong? The main reason was my shoes. I was wearing completely new Saucony running shoes that had never been broken in. To make matters worse, they weren’t even my usual model. I’ve worn Omnis for almost three years now and these were Shadows. The socks I was wearing were also completely new, not a single mile logged on them. If we continue upwards, my running briefs and shorts had never seen a starting mat, my shirt was on a rack the night before and even my gloves were untested. Every single garment of clothing on me was brand new. Most runners will read this and ask: what the hell is wrong with you? Don’t you know anything about running? Rest assured, I do. I’m pretty well-read on the dos and don’ts of marathon training and would never don new shoes for race day. But you know who doesn’t know that, and cares even less? United Airlines. Otter and I were supposed to fly into Little Rock the night of Friday, March 2, but due to weather, our flight was cancelled and we were booked on the Saturday morning flight. Fair enough, I’d rather live and race than die in a fire. So we went home after our field trip to O’Hare and returned the next morning. I neglected to realize that March 3 was the day that United’s merger with Continental became live, even though it seems like they’ve been at that for the last 18 months. Regardless, O’Hare was a circus, with the Premiere line looking like Black Friday at WalMart with many indignant passengers scoffing at the idea – nay, the nerve – of having to wait in line like peasants. I wasn’t too concerned about the line but instead about our flight. It didn’t seem to exist. No screens showed it and websites weren’t tracking it. Fortunately, this “ghost flight” was real and we had seats on it. We checked our bags and made our way to the plane. Roughly three hours later we were at the baggage claim, watching as our carousel turned off, our bags nowhere in sight. Fine. So our bags didn’t make it to Little Rock. At some point in the hair-raising bedlam that ensued when United tied the knot with Continental Airlines, O’Hare must have caught on fire and our bags were simply left near the airplane, lost and forgotten. I filled out the necessary paperwork, gave them the address to our hotel and continued with my day. There was a flight coming in from Chicago at 6:30 PM, our bags will be on it. This has happened to me before, so I wasn’t too concerned. We went to the Expo, picked up our stuff, gorged on Italian and checked into our hotel. As the hours ticked on though, that awful possibility became a very real one. We called United devoutly for updates and the most we got was the same automated message, telling us that “bag specialists” were “looking” for our luggage and that they would post updates. I imagined our bags squished under one of those loud beeping golf carts that are driven in airports by large, cantankerous people, gathering dust, out of sight, forever. United employees would be in the background, drinking expensive champagne while a rotary phone rang in the distance. “So, it’s possible that our bags might not be on that plane,” he suggested. “We won’t know that until 7 or so, so why don’t we just go buy some stuff before the stores close and if our bags magically appear, great, we’ll return everything.” It sounded like a good idea. Unfortunately, the nearest running store, Go! Running, closed at 5, so we were left to wade through unsorted piles of random shoes at a derelict Sports Authority from the former Soviet Union. Somewhere amid the tumbleweeds and trashfires, I managed to find a pair of Saucony’s that I was comfortable wearing. 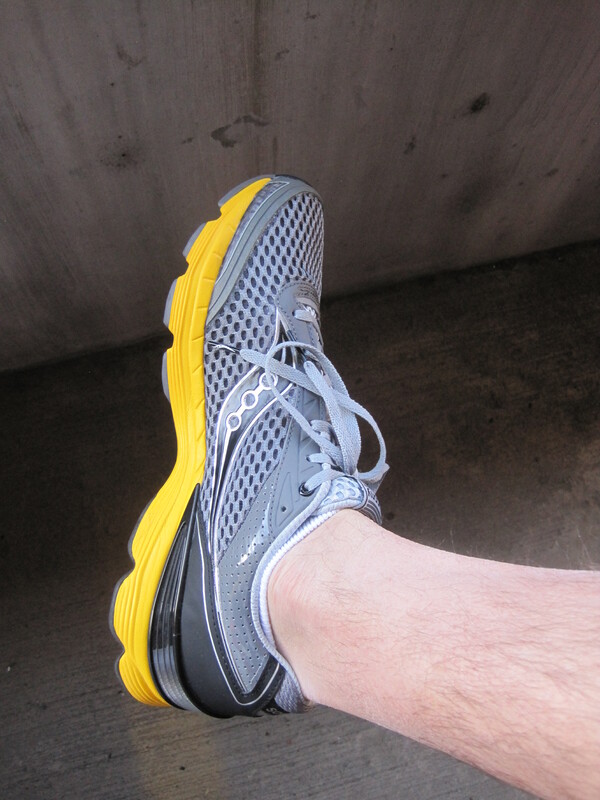 They felt light, snug and online reviews said it was a reliable shoe. I romped around the store and confirmed that yes, they felt nice. But would my feet hold up in them over 26.2 miles? 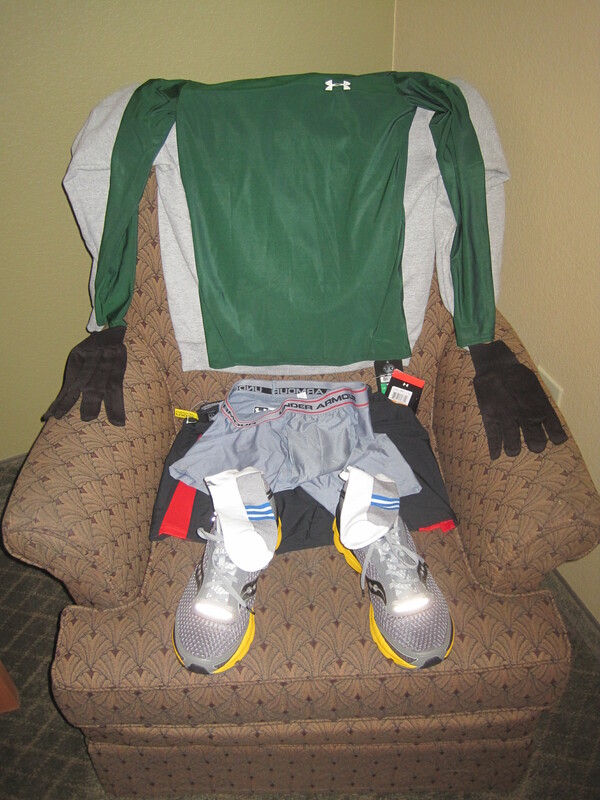 And what about the clothes I bought, which were a random assortment of clearance items, some too small, that barely passed for a race outfit? At this point, I had stopped caring. I was going to run tomorrow in whatever was available. United had forced me into a corner but I would fight my way out. Since Otter didn’t dare shop with the proletariat, we went to a nearby Nike Factory Store where he made credit card sparks fly. We called United a few more times and got the same unnerving automaton, telling us that nobody knew anything about anything. I somehow managed to go to sleep despite this headful of ghosts. It was a crisp, breezy morning, not a cloud in the sky. Temperatures were in the low 40’s and humidity didn’t seem to be an issue. We arrived offensively early in hopes of landing a good parking spot and were simply waiting for the right time to leave. After a few Sum 41 tunes, we made our way to the start, which was just south of the Arkansas River in a comely section of town known as River Market. Despite hosting over 8,000 runners, the area wasn’t very congested. Port-a-potties had no lines and Gear Check was a painless and fast exchange. Volunteers were eager to help and there was a general liveliness in the air doing its best to assuage our escalating anxiety. The race started at 8 AM sharp. I decided to join a 3:45 pace group and stick with them for awhile. They were led by two pacers who wore bright, neon green shirts. They were a jocular, talkative pair. In fact, I did more talking in the first half of this race than I have at any other race combined. Runners can be a loquacious species and they relish at the opportunity to go off on race experiences with like-minded lunatics. If that weren’t enough gab, one of the pacers, Andy, had prepared Arkansas-related trivia questions for every mile. The first half of the course was a very geometric path, cutting across North Little Rock and back through downtown in 90-degree angles. It alternated between city streets and neighborhood roads, passing such sights as the Governor’s Mansion and Little Rock Central High School, where the Little Rock Nine were enrolled in 1957. This turned out to be one of the most important events of the Civil Rights Movement (I only know this because Otter pointed it out after the race). I did my best to soak in the sights, but I was too distracted. Every time my toes would rub against my shoe, I’d think, how will that feel at mile 20? A tiny little ache in my knee in the first 5k would make me ponder, is this going to get worse? Despite having logged hundreds of miles leading up to this day, every step felt like uncharted territory. And yet, things were going smoothly. Tiny aches would come and go without any serious consequence. Around mile 12, the course sloped downward and our pace group wasn’t taking advantage of it. So I decided that it was time to move to faster pastures. By this point, the half marathoners had split off and the full marathon’s halfway point was right in front of the state capitol. I passed it in 1:50:32, which was my fastest first half, but only by about ten seconds. From there, the course veered off west and upwards into the hills of Pulaski Heights. We had driven this part of the course the day before and knew that we’d be facing a 2.5-mile serpentine climb. I wasn’t too tired yet and had created a decent gap ahead of the pace group, so I didn’t slow down too much. Pulaski Heights’ denizens were out on lawns and sidewalks, cheering on runners, especially outside the local Baptist Church, whose lawn was covered in American Flags. It wasn’t long before I reached the top of the climb just past mile 16, feeling oddly confident and eager to keep pushing the pace. In fact, the last 5k had been faster than the flat one before it. Since the next mile was a steep descent back to the main road, I was eager to speed up even more. I remember Andy the Pacer telling me to take it easy on the downhill because I’d regret it later on the flat roads. As nice as he was, I decided to ignore his wisdom and screamed down at a sub-7:00 pace. “If I were that tall, I’d stride like that as well,” a fellow runner noted as I bolted past him. I hunched my shoulders and made a “W” with my arms. It was the only apology I could offer for having the body of a grasshopper. “Solera!” another runner called out at the end of the hill with the tone of a close friend. “Going for a negative split? Keep going, buddy!” I wonder if he read everyone’s name off their bib and gave them similar shouts of encouragement or if there was something special about me. I saw him later at the airport security line and thanked him for the shout-out. At mile 18 the course reached Riverfront Drive and began a westward out-and-back alongside the Rebsamen Park Golf Course. For the rest of the race there would be no shade. Winds had picked up from the west and for the next three miles we would run right into them. Normally, I sneer at headwinds, but humidity levels had dropped to 30% and the breeze cutting through us was pure heaven. The fact that my shirt was lined with streaks of salt was a great sign. I wasn’t sweating nearly as much as I do in races and was showing no sign of overheating. Up ahead, I saw another pair of bright, neon green shirts and a tiny pace sign bobbing in between them. I had caught up to the 3:40 pace group, my PR time. The 3:40 group had thinned out to about four people. I stayed with them until the 20-mile mark, where organizers had put up a large, inflatable doorway that ushered runners into the dreadful last 10K of the race. The marathon is an unpredictable beast and that arch was like an ominous gate. I was now in the great unknown, running in the low 8:00’s, pushing myself, waiting for the moment where the wheels fall off. The pace would eventually catch up with me at mile 24, where I began feeling short of breath. But it wasn’t until we reached mile 25 and a devilish outcropping of land that I came face to face with the proverbial Wall. For the previous eight miles, it felt like nobody had passed me. But as I scaled what felt like a mountain with just a mile to go, I saw several runners flank me, their legs stronger than mine. I had definitely run out of energy and my legs had started to complain. But I refused to go under a 9:00 pace, so I kept moving forward, zoning in on people ahead of me and reeling them in. With about half a mile to go, I heard spectators yelling “Go 3:40!” I turned around and saw a green-clad runner holding a pace sign. That lit a fire under me. I was determined to finish under 3:40, so I couldn’t let him pass me. 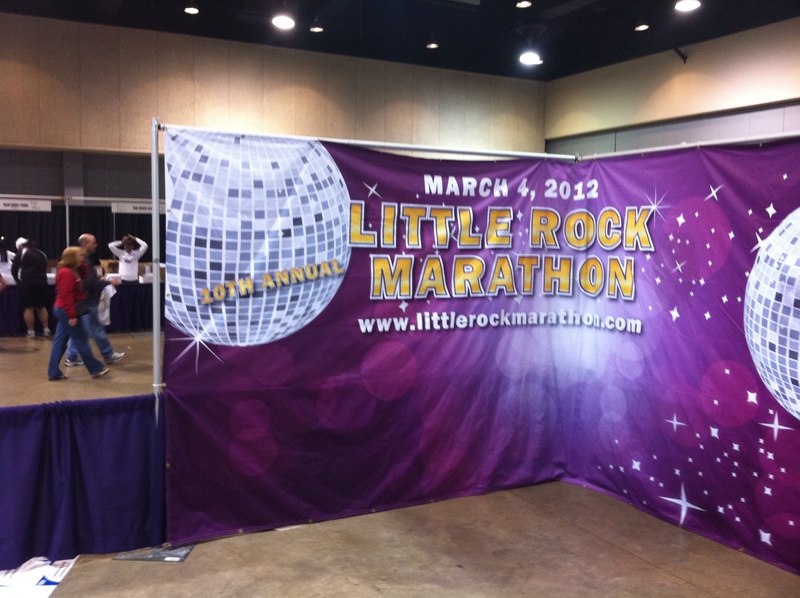 Mustering the last bit of drive in my legs, I kicked forward through the finishing chute, the glittery, purple banner of the 2012 Little Rock marathon in sight, the area flush with crowds. The race announcer called my name as I crossed the mat in brand new shoes and a race outfit that until that morning had never experienced a single mile. All my aches and pains vanished as I stopped the clock in 3:39:05, a new personal best. As I hobbled past the finish line, I had very little time to smile at my accomplishment before I got my first look at this year’s finisher’s medal. I knew it was going to be big, loud and ostentatious. But it was something else entirely to actually behold it and wear it. A cheery volunteer lifted an obnoxiously large explosion of purple and grey glitter, a dinner plate sized hunk of tacky that is impossible not to love, and rested it on my weary shoulders. They definitely delivered on size. The zero in “2012” in the middle is the size of most large finisher’s medals, so we could spy other marathoners from a mile away. There were no less than five of them reflecting big purple circles all over the walls of the Little Rock airport later that afternoon. We finally received our bags an hour before our flight was scheduled to leave back to O’Hare, fittingly ending a tumultuous and character-building weekend. With my medal doubling my bookbag’s weight, I came back to Chicago with my confidence boosted. Not only had I improved my marathon mark by two minutes, I had done so in completely new shoes. I had the usual aches and pains, but nothing uncommon. In other words, there’s something right with my stride and gait. United Airlines put me in a tough situation, a veritable runner’s nightmare, and I came out victorious. Let’s hope I keep building upon that form as I continue this journey into the dark realm past mile twenty. As for Otter’s story, I’ll let him recount it in his own words … if he ever gets around to it. This entry made me lol a lot, which must mean you had an awesome attitude about the whole bag/gear situation! Totally worth the stress to have TRIVIA during a race AND a ridiculous medal. Please tell me you had a chance to wear it out to a bar/restaurant? Otter definitely wore it at Wendy’s post-race and later at the airport. I kept in in my bag because walking with it felt like a baby was constantly punching me in the chest. Oh my gosh! I can’t imagine the feeling of realizing the night before my race that I wasn’t going to have my favorite pants, my super comfortable shirt, or the shoes that have served me well for so many miles. Way to look on the positive side (and get a personal best). Congratulations! …Oh and it’s exciting that you completed a full marathon and got a PR. Right. Priorities. Hey man! This is Katie, one of the 3:45 pacers. I was wondering if you ended up ahead of us or behind. You made the paper here, google the Arkansas Democrat-Gazette, and your picture is there. I’m glad you had a good race. Your description is great, the “running in unknown territory in the low 8’s” means that you had exactly what you needed in the tank at the end. Congrats on the PR… I hope you didn’t set the precedent of losing your luggage for a great race! Glad they managed to capture that awful crawl up the last hill. Hey Dan, it’s Andy, the other 3:45 pacer…the one with the trivia. Apparently I’m slow finding this post. It was great chatting with you at the race. Congrats on the new PR, I’ll hope to run into you at another race down the road. Congratulations on your PR! That medal is out of control. And I think as a direct result of this, I will carry on my running shoes from now on. How stressful, but glad you eventually got your stuff back and had a good weekend regardless! Wow, what an adventure! Congrats on the new PR! I ran it too, it was a great event. Great job on both the race and the report! A very fun read, and a very impressive accomplishment. At least United gave you some bragging rights, eh? Yikes. Thanks for reading and for your comment. I had a great time in Little Rock and would definitely recommend it to others. I ran for about a mile with a gentleman from Oklahoma and he is planning on running the Memorial Marathon this year — he definitely gave it a glowing review as well. Congratulations on keeping your LR Marathon streak alive! good account of the race, I decided to carry all my running stuff with me as carry on luggage just so I did not have to go through the same thing you did with the airlines(we also flew united). I ran the race strong in the first half then slowed down with back spasm’s by mile 18 but I thought the course was a good challenge and look to going back there and getting a better time. The medals were huge and I made the mistake of burying it deep in my luggage and had to wait till security went thru my bags at the airport. The smart people wore the medals thru security. Great race! I was around the same pace as you on the back half and remember seeing your green salt-stained shirt! Kudos up staying calm with all new apparel and shoes! Congrats! PR for me too! Enjoyable account! I was going for 3:45 and had you beat for the first half – 1:49 – but sucked wind on miles 20-24. I distinctly remember your salt-lined dark green shirt blaze past me around mile 23. Still ended up with a PR of 1:50:49 and will live to run another day. Wow that was some adventure prior to the race! Way to keep a cool head and control what only you could control. And a PR to boot! You just keep knockin’ ’em off. Very cool. 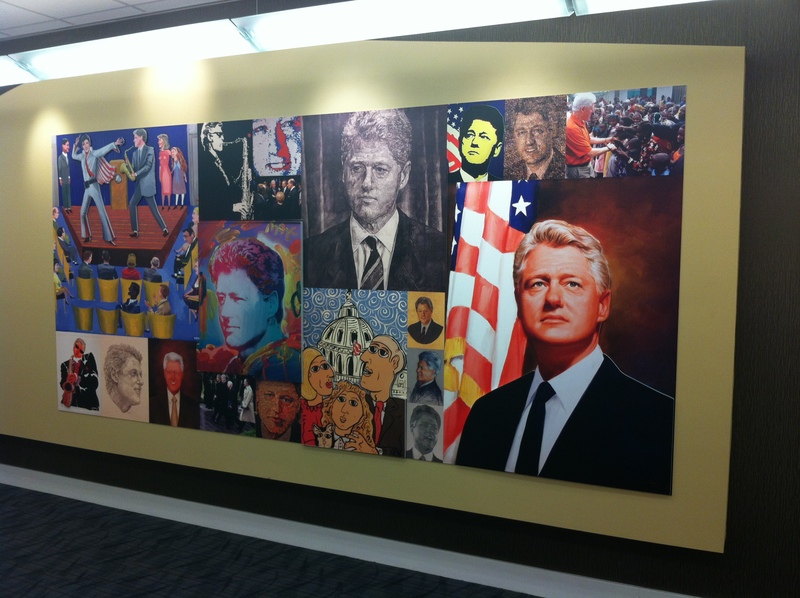 What a great entry! Kudos to you for dealing with United airlines so well! And a PR at that!!! Don’t tell the baggage people that or they’ll assume they helped:) Can I “steal” your description of the medal for my blog (obviously, credit will be given:))? I ran as well and honestly couldn’t word it better if I tried…. 🙂 Congrats on #19!!!!! You are more than welcome to use my description 🙂 And kudos to your marathon finish as well! Great read. I am curious as to how you made that map. Is there a website that does that? 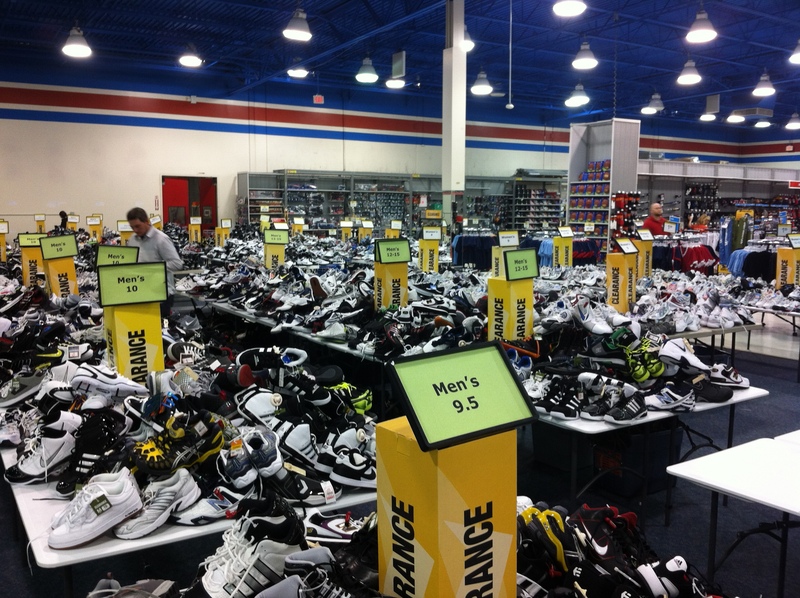 I couldn’t imagine having to try new shoes on marathon day. Crazy looking medal! Congratulations on your PR in Little Rock! I was there as well, running my first 10K as part of my training program for completing my first half-marathon, which is on your schedule: Oak Barrel! Am I crazy for choosing that as my first half? I’ve just subscribed to your blog and look forward to reading more. 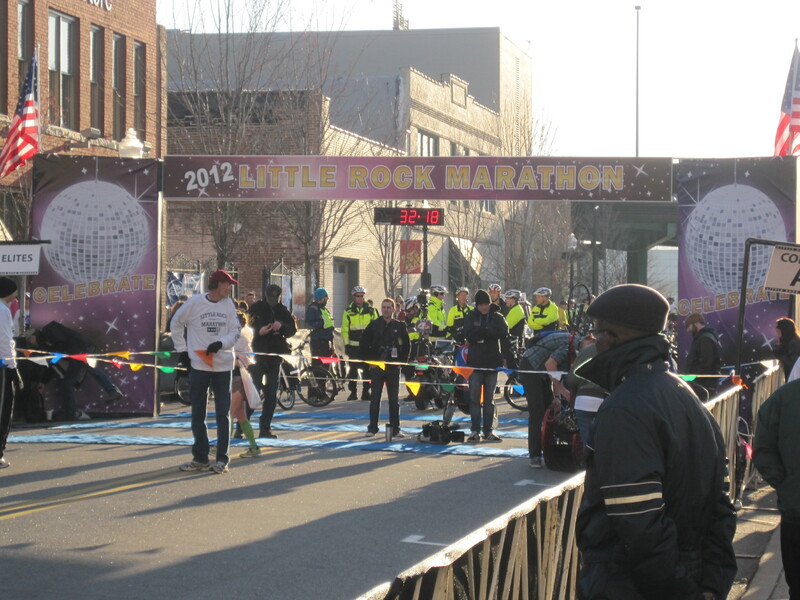 Dan, i stumbled upon your blog from the Little Rock Marathon Facebook page and enjoyed the read. Yesterday my mother in law emailed me some photos she took of the race. I was looking through a few and just happen to notice you in one. Its a picture of you right as you are passing Dickey Stephens park. I would’ve had no clue it was you if i hadn’t read your blog and then noticed your “new” outfit. If you would like me to email it to you just give me a shout. Lsmith@arkansasbolt.com. Hope you come back again next year!! Congratulations on your PR and your crazy medal! I can’t believe you ran in all new gear. Dan– just checked out some of your posts. You have a great way of describing the race, I really enjoyed reading the recap! Not an easy thing to do, in my opinion. Writing about a marathon well, nor running one. Congrats on the PR– and thanks for the running motivation, this blog is great! That medal is AWESOME! Congrats on a great race! That medal is ENORMOUS!! It’s a dinner plate! I’m going to have to follow your blog! I’m trying to do a race (of any kind – half, full, tri, etc.) in all 50 states as well! Ok, this story? Is frigging awesome! I LOVE IT! I have lived in fear about my shoes getting lost on a flight before, so I always wear them on the plane 🙂 Where did you get that map you made, with marathons / half marathons completed by state? Thanks, I have a map on mine but I like yours way better 🙂 I was thinking about doing Little Rock next year, unless it’s the same time as Tulsa. 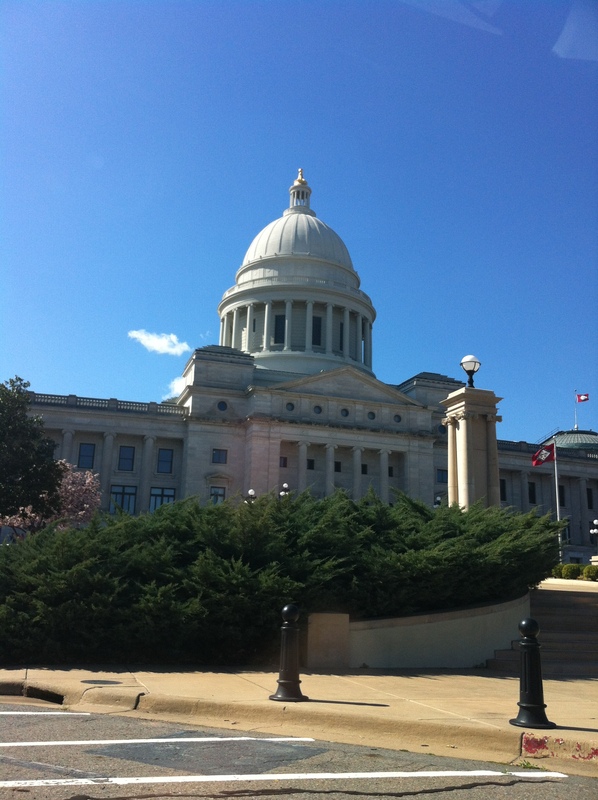 Your post may have swayed me over to Little Rock…. POSTSCRIPT: 4 months after the race, United finally refunded us for the $$ we spent on brand-new gear the day before the race. VICTORYYYYYY!! Big win! Kinda glad that I’ll be driving down. LOL! I hope there is more to the race than that giant medal! LOL! Looks huge! Actually sounds like a great race too. Can’t wait to run the 2014 version which is supposed to be “epic” and the theme is super heroes. The people watching should be the best part!